The primary purpose of our national parks is for the protection of Ireland’s biodiversity. Not only do they protect our natural heritage, but provide us with exceptional outdoor areas to explore. National parks provide us with stunning landscapes, forests and recreational facilities.They give a home to our native wildlife and can offer protection and refuge to threatened species. They provide invaluable economic, social, cultural and health benefits too. We have a responsibility to protect and conserve these beautiful parks so that future generations can enjoy them as we do. Outdoor activities and being in nature have a healing influence on our bodies and minds. In turn, this has a positive psychological effect by reducing stress. Take some time out, relax and revitalise your life and go on a self-guided or guided hiking tour.Children also reap the benefits of playing outdoors, exploring and being in nature. National parks are a tremendous resource for families and friends to enjoy. Wicklow Mountains National Park in the south-east. Finally the Ballycroy National Park, located on the western seaboard or northwest Mayo. Each national park has its own beauty and attractions that will astound, surprise and amuse the many hundreds of thousands of visitors that alight on them each year. 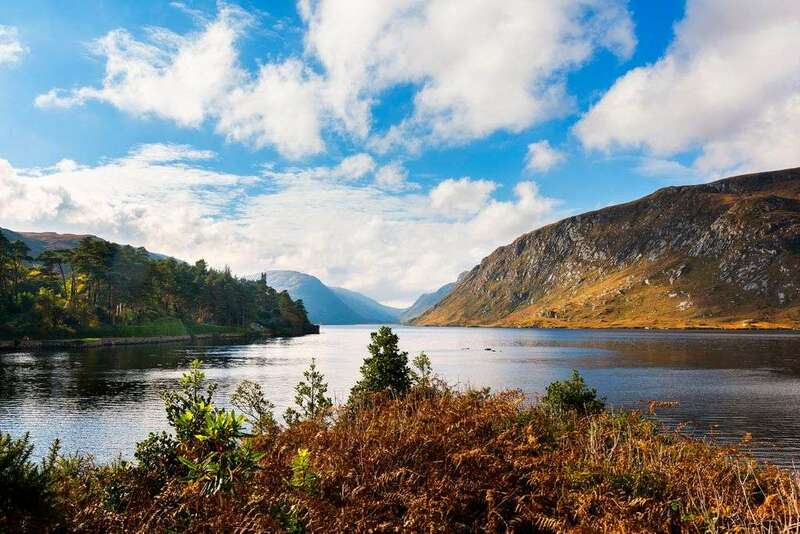 Did you know Glenveagh is the second largest parkland in Ireland and not only boasts rugged mountains and pristine lakes but peatlands and quartzite hills? It is in the heart of the Derryveagh Mountains in the north-west of Donegal. Entry to the park is free, and it is open from 1st November to the 16th March annually.There are six walking trails, ranging from 1km-8kms for novice walker or families. 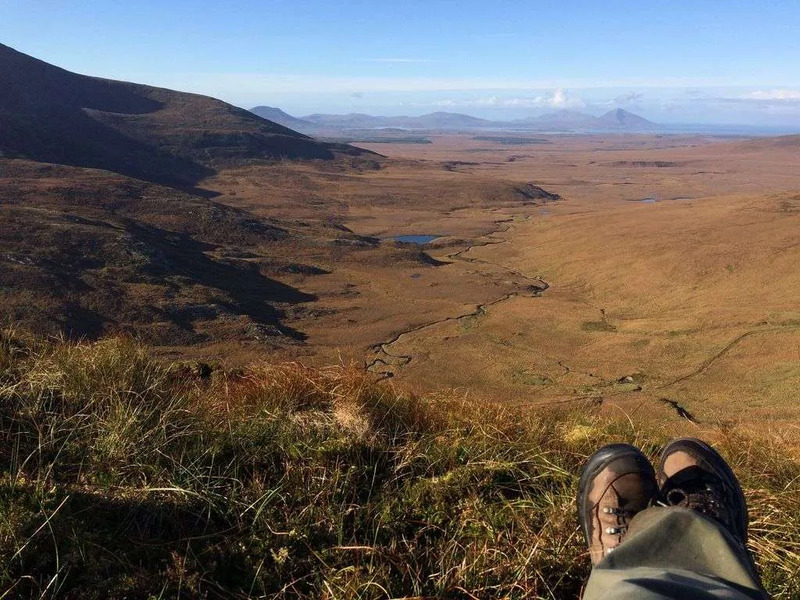 There are 16,000 hectares of North Donegal’s rugged, remote landscape to explore for the more experienced hiker.Pre-book The trail walker bus service to drop you off at the start of your walk or collect you from the end as these walks go from A to B.
Ballycroy is on the western seaboard in northwest Mayo. 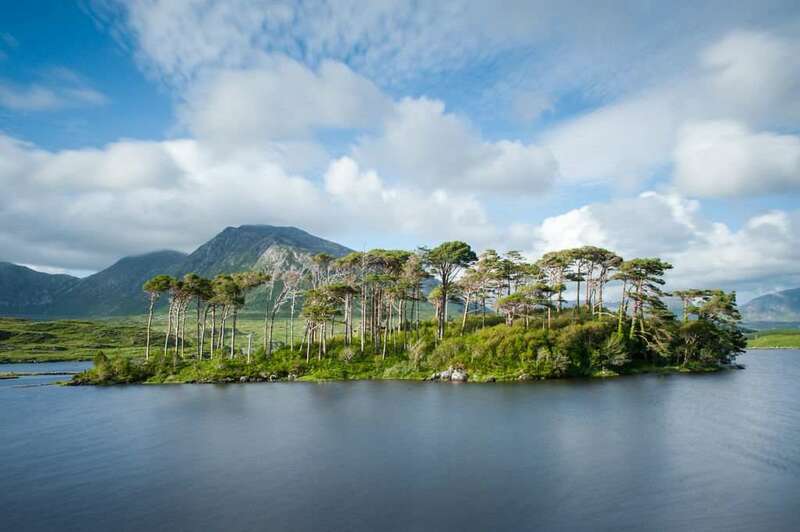 You will find the Nephin Beg mountain range here, an uninhabited and unspoilt wilderness with one of the largest and one of the last intact active blanket bog systems in Europe, 11,000 hectares. 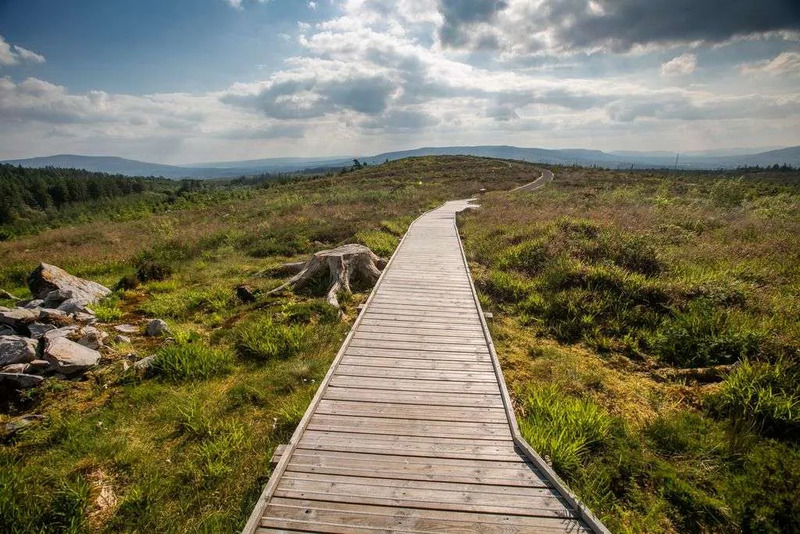 This bog system has both Scientific and scenic significance for the park.There are short walking trails for the novice and moderate walker, but the park is ideal for anyone wishing to hike in remote areas and is recommended for experienced hillwalkers.The Bangor trail is the main 40km route through the park and follows an old road through the Nephin Beg mountains. 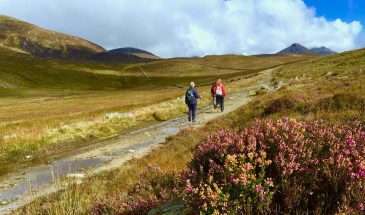 This walk is challenging and for the expert accomplished hillwalker. 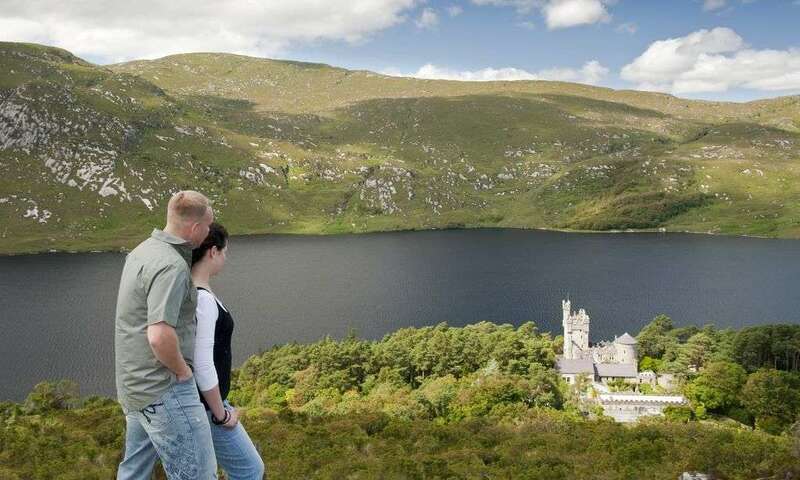 Situated in the heart of Connemara, Derryclare Lake is a stunning lake with superb views that make the visitor gasp in awe at the wonders of nature in this beautiful part of Ireland. 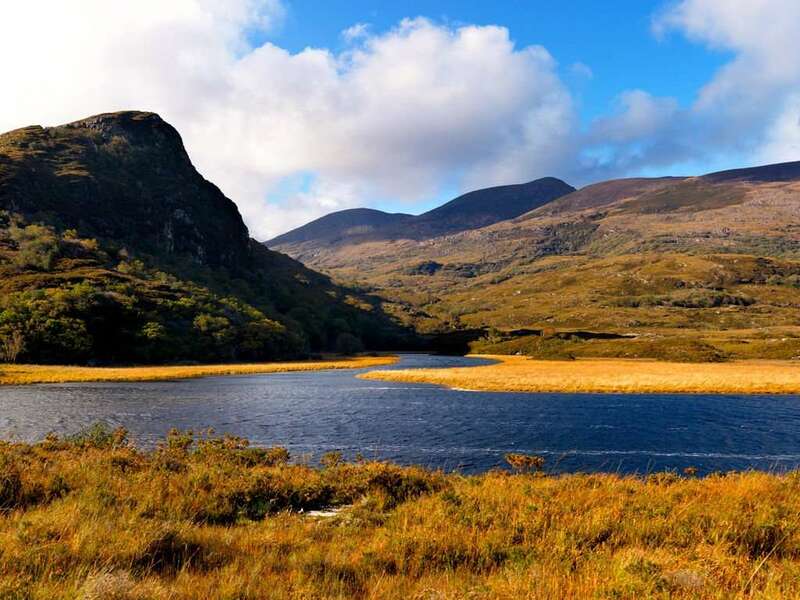 Derryclare Lake is just before Letterfrack, located in the heart of the famous Connemara National Park. The Twelve Bens Mountains are some of the mountain ranges you will find here. As well as the 2,957 hectares of scenic mountains, you will be delighted with vistas of Western blanket bogs, heathland, grassland and woodland. Admission to the park is free, and the park is open from all year. There are four looped trails, ranging from 0.5 km to 3.7 km, all starting from the visitor’s centre. This park is located in the South Eastern corner of The Burren and contains all the habitats you will find in the Burren landscape. 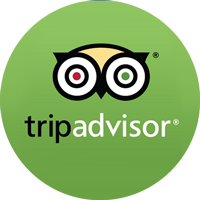 It will astound you with its beauty with examples of limestone pavement, calcareous grassland, hazel scrub, ash and Hazel woodland, Turloughs, Lakes, Petrifying springs, Cliffs and fen. The word ‘Burren’ derives its name from an old Irish word, meaning a rocky place.This National park is 1500 hectares in size. There are seven waymarked trails, ranging from moderate to very difficult, suiting those experienced and expert hikers. Each signposted with colour coded markers. 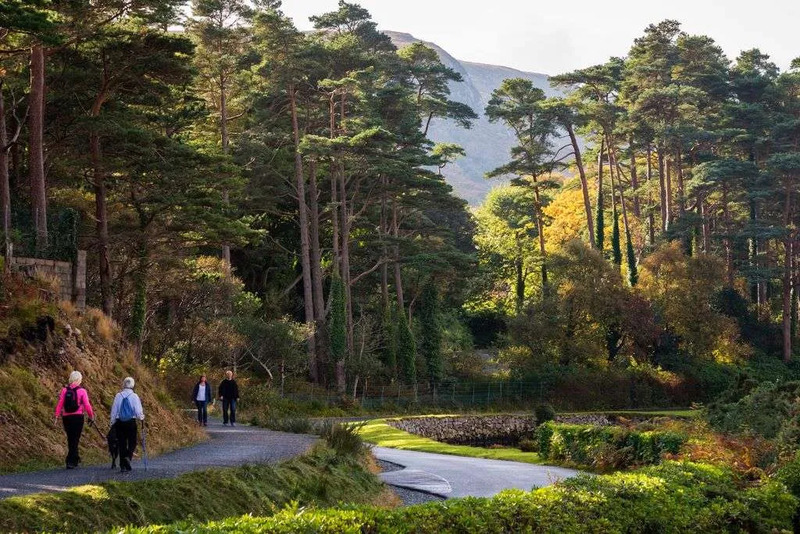 If you want to visit the highest mountain range in Ireland, the McGillycuddy Reeks, and see a spectacular national park at the same time, the Killarney National Park is a must.Nestled inside the park, you will find Muckross house, a 19th-century mansion house. 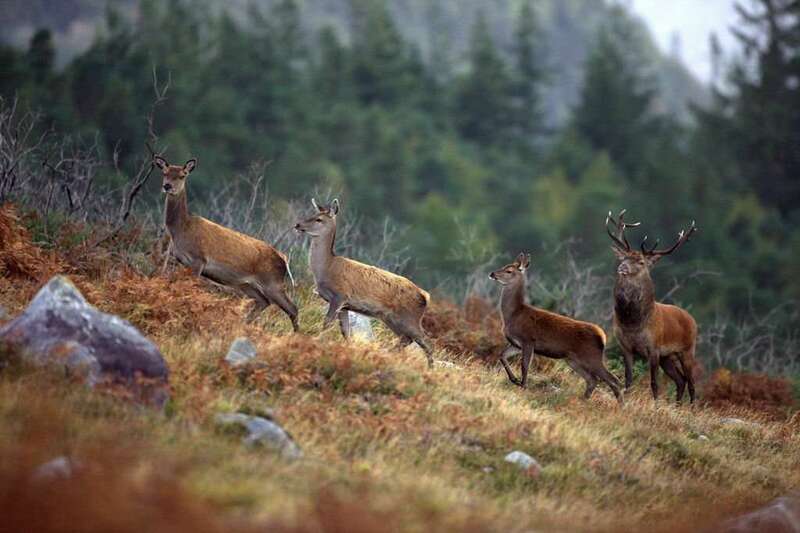 Here you will also come across native Oakwood and Yew woods, which are of national and international importance and of course not to forget their very own herd of native red deer!There are seven walking trails, ranging from multi-access to challenging, ranging from 3-8 km. Wicklow National park is found on the east coast of Ireland and covers part of a mountain range, The Wicklow Mountains, that extends over most of County Wicklow. Here you will view open vistas with winding mountain roads interrupted only by Forestry plantations, where fast flowing streams descend into deep lakes of the lowlands and wooded valleys. 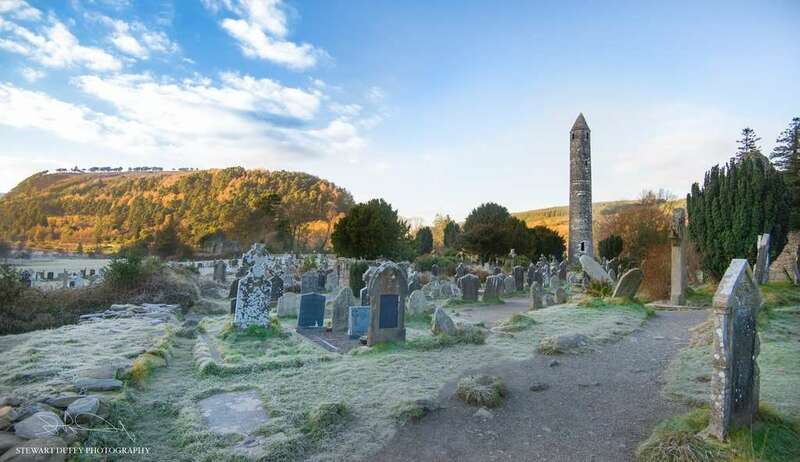 There are nine way-marked walking trails in the valley of Glendalough. Each trail has colour coded signposts, and the walks range from a short half hour stroll to a long 4-hour hill walk. One of the most important factors is to ‘Leave no trace’. Make sure to remove everything that you bring on the trail with you, and this includes fruit skins! Leave your dogs at home- mainly when walking to any of the park’s trails where wildlife live. Leave plants, animals, rocks, shells, soil, and flowers as you find them- disturbing these flora and fauna and wildlife can ruin these habitats. Imagine if every visitor took a souvenir! The parklands are there for us to enjoy, cherish, spend time in, become familiar with, learn from and have fun. Visit your nearest parkland soon and believe me, you will get hooked!